Details: An open-day was held at Stagecoach London's Barking Garage on 30th March 2019, to mark the 40th anniversary of the last London Transport RTs in passenger service. The event was very well attended, although it has to be said that a large proportion of the visitors looked like they might have been there in 1979 as well! Two service vehicles were present, this one being the one that was easy to miss. Anonymous red OV65DSY is based at West Ham garage and used for unknown general purposes (ie not engineering support). 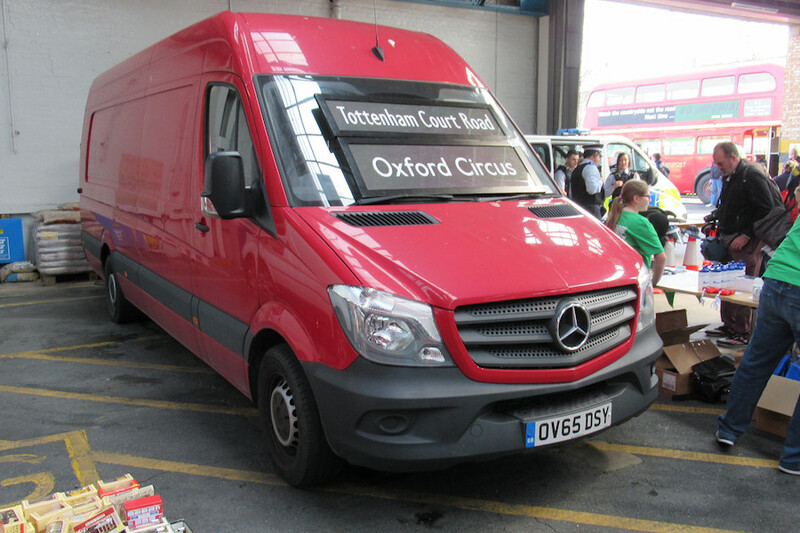 A Merecedes-Benz Sprinter, it is to the longest of four lengths, a whopping 7.3 metres. A slip-up in LTSV database consistency means I have recorded this van as being mid-height. It is technically mid-height, but Mercedes call this 'high-roof', and this was used on LTSV for the description of the LBSL IRUs. Which are the same height. As this van. So, um. Anyway, the van was parked inside the garage, next to a stall selling bus-related items such as moquette cushions!